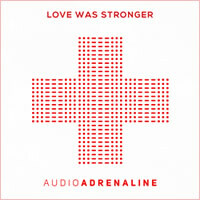 NASHVILLE, Tenn.— “Love Was Stronger,” the highly-anticipated new single from two-time GRAMMY® Award-winning recording artist and one of Christian music’s most popular bands, Audio Adrenaline, drops today, in advance of the May 5 release of the group’s Fair Trade Services sophomore album, Sound of the Saints. In addition, a new group of musicians is unveiled as Audio Adrenaline hits the road with Newsboys’ “We Believe…God’s Not Dead” 2015 Spring Tour. Audio Adrenaline begins the next chapter in their history-making tenure with a new lineup featuring former Stellar Kart frontman Adam Agee, along with Dave Stovall, formerly of Wavorly; guitarist Brandon Bagby, whose touring credits include Plumb and Seventh Day Slumber; and drummer Jack Campbell. This year also marks the transition of group co-founder and bassist Will McGinniss from touring to an increased role with the Hands & Feet Project, an organization he co-founded, where he currently serves as president of the board. Following the band’s hiatus in 2007 in the wake of former lead singer Mark Stuart’s vocal health issues, a new lineup of veteran artists rekindled Audio Adrenaline in 2012. Continuing on to answer the band’s original call to bring the story of orphans in Haiti — and around the world — to the forefront, Audio Adrenaline partnered with Fair Trade Services and the Know Hope Foundation to release Kings & Queens, which saw multiple radio singles impact listeners, including the smash title-cut. Audiences across the country will be able to preview new music from Audio Adrenaline’s Sound of the Saints during Newsboys’ “We Believe…God’s Not Dead” tour, also featuring Finding Favour and introducing John Tibbs. Sponsored by Food for the Hungry and Liberty University, the tour begins February 12 in Fayetteville, North Carolina, and will stop in more than 40 cities before concluding May 9 in Greensboro, North Carolina. “Love Was Stronger,” the band’s highly anticipated new single, is available on iTunes and other digital outlets today and goes for adds at Christian radio February 13. Since their debut in 1986, Audio Adrenaline has been one of Christian music’s best-loved bands. The group has garnered two GRAMMY® Awards for Best Rock Gospel Album (Worldwide, Until My Heart Caves In); five GMA Dove Awards; a Gold-certified recording (Bloom); and 14 #1 Christian radio singles, including signature songs “Big House,” “Get Down” and “Hands And Feet.” In 2004 the band created the Hands & Feet Project to “raise a generation of orphans who will grow into men and women who will have a relationship with Christ and be leaders in their communities.” In addition to constructing Children’s Villages near Jacmel and Grand Goave, Haiti, Hands & Feet continues to impact orphans and children throughout the country. Follow Audio Adrenaline on twitter @audioadrenaline.